The painting, Morning Over the Gulf (36” x 56”) was juried into the California Art Club’s 108th annual Gold Medal Show, which is being held March 3–29 at the former Pasadena Museum of California Art. Click here for more information. A show of David's work opened September 1st at Scharffenberger Cellars in Philo CA in the beautiful northern California wine country. It included these two recent studies, Anderson Valley Foothills and Sundown at Chapman Point. A couple of David's favorite "sea & skyscape" images can be found in a this book of California paintings. David's painting, Buckhorn, was juried into a California Art Club show, A Journey Along the California Coast, in celebration of the book, Painting California: Seascapes and Beach Towns. The painting, Atlantic, was the winner in the "Water" category of the 2015 Plein Air Magazine December/January Salon Competition. 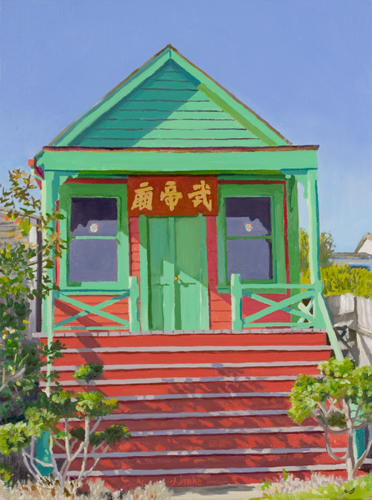 David's painting, Chinese Temple: Mendocino appeared in the book, California Light: A Century of Landscapes. "In 1909 the California Art Club was founded, and since then our artists, patrons, and visionaries have worked to capture the beauty of California's landscapes. California Light, from Rizzoli International, one of the leading publishers of art books, offers up a comprehensive look at the Club's paintings over the past 100 years showcasing 300 landscape paintings created by artist members of the Club."